An exhibition in celebration of David Driskell’s 75th birthday will be on view at DC Moore Gallery from October 12 - November 11. The exhibition, which opened this summer at the Center for Maine Contemporary Art in Rockport, Maine, concentrates on work from the years 1996 through 2006. It is accompanied by a full color catalogue with an introduction by Lowery Stokes Sims and an extensive interview with the artist by Bruce Brown. In fall of 2007 the exhibition will travel to the Hampton University Museum in Virginia. Painter, sculptor, scholar, teacher, collector, and curator -- David Driskell is a true Renaissance man. For over three decades he has been one of the world’s leading authorities on African American art. His own art brings a wide range of references to a semi-abstract, modernist style. Drawing inspiration from African art, nature, and the arts of quilt-making and basket-weaving, Driskell’s richly colored gouaches, watercolors and collages are energetic and painterly. He often utilizes torn strips of painted canvas and paper, which are collaged side by side and are further worked with calligraphic strokes. Born in 1931 in Eatonton, Georgia, David Driskell was educated at Howard University and earned an MFA in 1962 from The Catholic University of America in Washington, D.C. He has enjoyed a long and distinguished career as a scholar and curator and has contributed significantly to scholarship in the history of art on the role of African American artists in America. He has authored seven books on the subject of African American art, co-authored four others, and published more than forty catalogs from exhibitions he has curated. His articles and essays on African American art have appeared in major publications throughout the world. Two Centuries of Black American Art, a book and traveling exhibition organized by Driskell for the Los Angeles County Museum of Art in 1976, was a groundbreaking exhibition that is universally considered to be a watershed in African American art history and scholarship. Recent major traveling museum exhibitions and books include The Other Side of Color: The African American Collection of Camille O. and William H. Cosby, Jr. and Narrative of African American Art and Identity: The David C. Driskell Collection, which traveled to ten museums across the country including the Newark Museum. In 2000, Driskell was awarded the National Endowment for the Humanities Presidential Medal for lifetime achievement in the arts and humanities by President Bill Clinton. In the fall of 2002, The David C. Driskell Center for the Study of the African Diaspora opened at the University of Maryland. In years to come the Center will, through its various programs and activities, become a major and influential force in the study of African American art and culture. Driskell’s paintings and prints have been featured in numerous solo and group exhibitions in galleries and museums throughout the U.S. He has exhibited internationally in England, Holland, South Africa, Poland, Brazil, Japan and Chile. His work is in the permanent collections of a number of major American museums, including: Arkansas Fine Arts Center, Little Rock; Baltimore Museum of Art, Maryland; Birmingham Museum of Art, Alabama; Corcoran Museum of Art, Washington, D.C.; National Gallery of Art, Washington, D.C.; Pennsylvania Academy of the Fine Arts, Philadelphia; Portland Museum of Art, Maine; and Springfield Art Museum, Missouri. 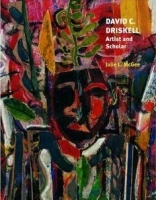 Also released in the fall of 2006 will be David C. Driskell: Artist and Scholar, a 216 page monograph on Driskell’s art and life, written by art historian Julie McGee and published by Pomegranate.